Sharks were the first marine animal I fell in love with as a young girl. I would look up at the television and watch one natural history documentary after another, transfixed by the beauty of the underwater world. I remember being so impressed by the silent grace with which the sharks would swim, their nearly imperceptible movements propelling them effortlessly through their steely blue kingdom. I was simply spellbound by their streamlined, powerful bodies, their confidence, their unquestioned role as apex predators carving out order and balance in the sea. When I learned they had been swimming the oceans for over 400 million years, 200 million years longer than the dinosaurs, my awe and respect deepened. Multi-cellular life really only began to flourish 500 million years ago, which means that sharks have been here almost from the beginning of the picture-book of life! As I grew older I began to realize how people feared them and I was so sad to learn that films like Jaws resulted in countless sharks being hunted down just for being, well, sharks. This disconnect between our human world and the sea drove me to seek more understanding, and I consumed as much literature about sharks as I could get my teenage hands on! I have since given many lectures on sharks as a marine biologist, and have made it a life goal to swim with as many different species as possible. My fascination for these perfect predators has only grown stronger the more I discover how little we know. However, over the last twenty years I too have fostered a very real fear around sharks. It wasn’t the close encounters with Tigers, Bulls or Great Whites that nurtured this fear. It has been the chilling realization that no matter how long sharks have held dominion within the oceans, their very existence is now threatened by human beings. Our rapacious practices of seafood extraction are risking the survivability of almost all fisheries around the world and, most unfortunately, the demand for shark fin soup sees the brutal deaths of more than 70 million animals, annually. The problem of shark fishing at this scale is one that effects everything, for ecosystems are shaped by predators and we can already see how the loss of these top-order carnivores is causing cataclysmic implosions to fragile and intricate food webs. 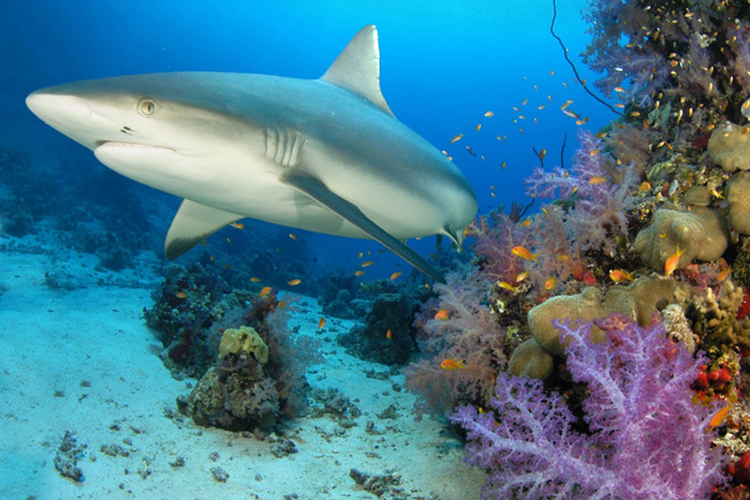 Today, more than 70 species of shark are facing extinction. The urgent issue of shark fishing has been prioritized by WildAid, a highly effective conservation organization whose noble mission it is to put an end to illegal wildlife trade in our lifetimes. With the weight of high profile celebrities behind their awareness campaigns, WildAid has helped reduce the demand for shark fin soup in China by 80 percent since the beginning of this decade. This is a phenomenal result! However, the work must continue as demand now rises in other Southeast Asian countries such as Vietnam, Singapore, Hong Kong, Macau, Taiwan, Indonesia and Thailand. At Apex, we feel proud to be supporting the efforts of WildAid in this critical time when our oceans and their animals are in such desperate need of protection, and satisfied to know that every dollar donated is being used to the fullest of its potential.